Polish Commonwealth, until 1793. Labun was in the south-central portion of the Polish-Lithuanian Commonwealth. On this map it is SE of Rowne (Rivne) and WSW of Zhyomierz (Zhytomyr) in the Wolynskie District. Russian Empire, 1793 - 1921. 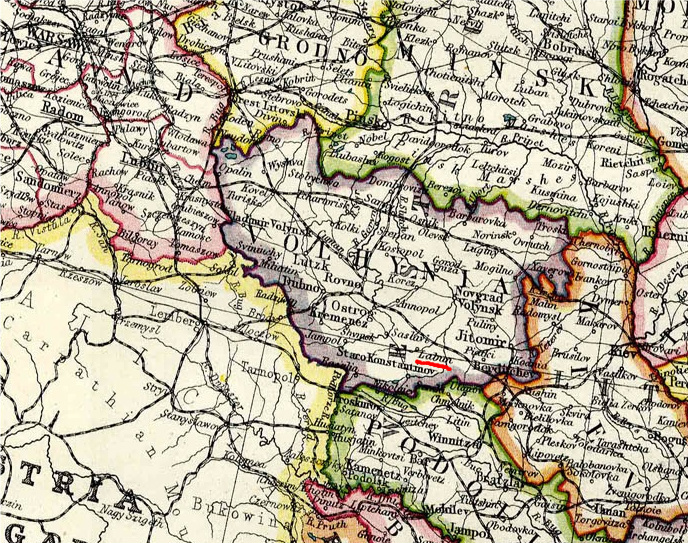 Labun was located in the SE portion of Volhynia Gubernia [here underlined in red]. Ukraine Administration Districts, 1991. Yurovshchina's location is marked with the purple dot.